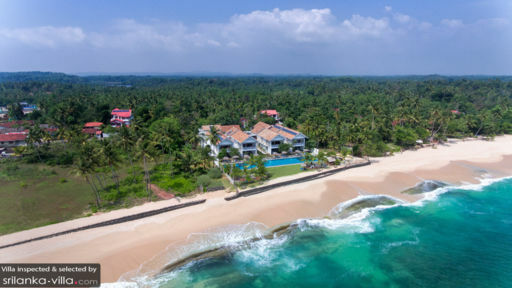 A serene beachside property on Mirissa Beach, Sri Lanka, with sights like Galle Fort, the streets of Matara, and a host of water activities just minutes away, Sri Sharavi Beach Villa is a complex of four, distinct villas. Designed to accommodate the natural landscape that serves as the foreground, the villas feature direct beach access, a shared pool that overlooks the Indian Ocean, large open windows to allow in ample light and fresh air, and many other stunning amenities. Each of the four villas – Aquamarine, Topaz, Amethyst, and Peridot – has three bedrooms, a lounge and dining space, as well as a pantry for light cooking. Four villas at Sri Sharavi Beach Villas comprise three bedrooms each – Ocean Signature Suite, Superior Deluxe Suite, and Palm Double Room. While the first two are found on the upper floor with balconies and spectacular ocean views, the Palm Double Room is located on the ground level. The bedrooms are spacious, air-conditioned and feature king-sized beds. There are cosy sitting areas in each of the bedrooms with armchairs or sofas. The bedrooms are accompanied by en-suite bathrooms fitted with nature stone vanities, rustic interiors, and walk-in showers. 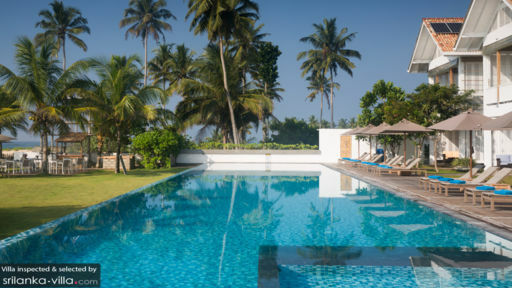 The villas at Sri Sharavi Beach Villas share a 40-metre swimming pool with two additional child-friendly pools for the ideal summer setup. Facing the Indian Ocean and the horizon, enjoy the changing hues of the beautiful, clear skies as you swim, splash, or relax alongside the pool on the sun chairs. Enjoy a chilled cocktail or lounge on the terrace while basking in the glorious panorama. The beach is accessible right from the front so all you need is to do is take a few steps towards the ocean. Guests can choose to dine beside the ocean under the starry-night sky for a romantic and intimate meal with loved ones. The four villas at the property have been designed in a manner that reflects the precious nature of their monikers. Corresponding colour schemes reel you in at first glance with pastel shades of amethyst, emeralds etc. The rustic and weathered furniture adds a bit of old-world, tropical charm to the living and dining spaces. Furnished with seating that is at once comfortable and homely, the living areas are a great way to end your day while retreating to your private heavenly corners. Sat facing the pool and the ocean, the living and dining areas are separated by glass doors that can be left open to the luscious sights around. 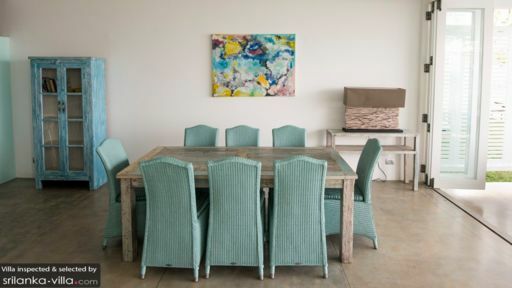 The dining areas are ideal for six guests with comfortable, cushioned chairs. A serviced pantry with a refrigerator and tea/coffee facilities is available to guests. The property itself offers an extensive food menu to choose from that you can relish beachside. There are a variety of services and facilities available to guests of the villas including an in-house spa, dining options, and a wine cellar with a vast selection of house wines and a choice of appetizers. There is a round-the-clock concierge service available to guests for everything you might need during your stay. A getaway with friends and family is always a good idea and at Sri Sharavi Beach Villa you can invite a large group along with you to explore the coastline of Sri Lanka with its splendid beaches, historical fortresses, local shops, and a thriving marine life. Whale and dolphin watching, a trip to Yala National Park, discovering the historical Galle Fort, and shopping in Matara are some of the activities you can get up to. This place is a must when living or visiting Sri Lanka. We live in Colombo and booked one night at a weekend to get away from Colombo. Well the atmosphere and views are really relaxing. We had two toddlers with us and they played quietly in the shallow end pool giving us the chance to relax. The decor and furniture. Beautiful place, great service and baby friendly (we travelled with our 1-year old daughter and she was given a cot, high chair, swimming rings and plenty of smiles!). That said, it is also great for couples as there are different villas. Thanks Marcy and all for a lovely stay. Would definitely recommend! We stepped out of this hotel to visit Mirissa which took us the whole of 10 minutes. Why would you want to venture out when everything this place has to offer is perfect. The location the ocean the people the rooms the aura around you is truly wonderful. Will definitely be back ! we were there in april 2015 for a 6 days. We booked garden suite and we got upgrade, so we had the beach suita. it was very beautiful, clean and spacious. Just amazing. the food was good and the ambient also. Peopole were very nice and always there for you. We also took the massage which was very good! The view from beach suita is just breathtaking and the swimmingpool is amazing. I was swimming every morning before breakfast. Highly recommended and hope to return some day.. Myself and my friend were spending two weeks in Sri Lanka and looking for a peaceful and upscale villa to spend the final leg of our trip after tons of trekking and safaris. I was so happy to come across Sri Sharavi and even more happy and impressed with Marcy who runs these beautiful villas. As someone who has traveled extensively throughout Asia, I am always looking for gems to return to and take friends for holiday and I was very happy with these villas! My friend and I had been extremely sick during the start of our trip with food poisioning and Marcy and her wonderful staff were very accomodating to our food needs. We checked-in to our beautiful and upgraded ocean room and immediately headed down to the stunning and huge infinity pool where we spent most of our time. I absolutely loved how attentive the staff were from asking us for our breakfast orders to making sure our glasses of wine were always topped up it was truly a great experience. Marcy was a wonderful hostess and checked-in with us daily and offered wonderful tips to explore Mirissa and even helped us with getting a Tuk Tuk to explore and drawing a map of a nice morning walk for us to take. The fresh fish that we indulged in at least twice a day was so delicious and prepared so nicely. We can't wait to go back!!! I am so glad we discovered this place and really really excited to return!